TRIPLE shielding for maximum video performance and prevents signal loss & screen ghosting. Support for One Bit Audio format, such as Super Audio CD's DSD (Direct Stream Digital). 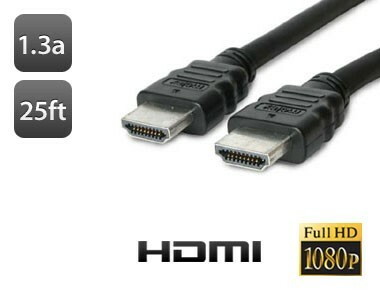 Supports distance of 10ft without any signal loss"
CERTIFIED with HDMI 1.3a specification (and backward compatible to all previous versions) to ensure your cable will work with today's and tomorrow's electronic equipment. Certified for compatibility with Sony PlayStation 3, Dolby True HD, DTS-HD Master Audio, Blu-Ray HD DVD and HD-DVD - 24K gold-plated connecting pins and ground connections to ensure excellent connectivity. RoHS Green Certified. Production process that uses laser jacket stripping & aluminum foil cutting with precise machine soldering.